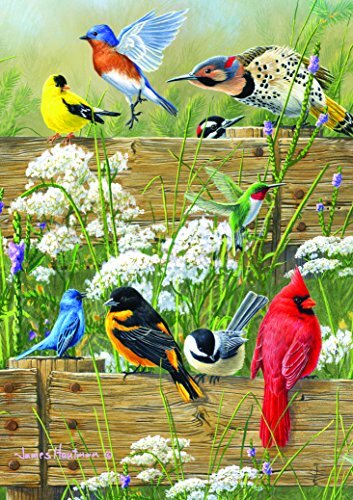 This 300 piece jigsaw puzzle, "Songbird Menagerie," is based on the artwork of famed artists James, Robert and Joseph Hautman. The Hautman Brothers are acclaimed wildlife artists whose work is part of a permanent collection in the Smithsonian Institute. The pieces of this puzzle are 67% larger than traditional puzzle pieces, which makes them easier to see and hold for a pleasant puzzle experience. Every Buffalo Games jigsaw puzzle is manufactured in the U.S.A. from recycled puzzle board. A precision cutting technique guarantees that every piece will fit soundly with the company's signature Perfect Snap. A bonus puzzle poster is also included so that you have a handy reference of what the completed puzzle should look like while you put yours together.